Learn to fly with us and experience the freedom and adventure of being able to pilot a plane. Come enjoy a Discovery Flight. We’ll put you in the pilot seat and let you see what flying is all about. Are you wanting to take your flight training to the next level? We offer both instrument and commercial flight training. We offer aircraft rental services to licensed pilots. Also if you would just like to take a flight around town with one of our pilots. We are based at Perry-Houston County Airport (KPXE) in Perry Georgia, serving the Middle Georgia area, including Houston, Bibb and Peach counties. Get your Private Pilot's license while enjoying the family friendly atmosphere at Perry Airport! Our fleet includes a Cessna 182Q, which is autopilot & Garmin 430 equipped, a Cessna 172N, which also has a Garmin 430, a Cessna 172P, 2 Cessna 152s, one of which is IFR capable and a Cessna 150. We charge $45 an hour for the instructor , $134 plus tax per hour for flight time in the Cessna 172s, $93 plus tax per hour in the Cessna 152s and 150, and $185 plus tax per hour plus tax in our Garmin 430 and STEC autopilot equipped Cessna 182Q. Block time rates offer up to a $10 less per hour discount. Instrument training, high performance, and biennial proficiency checks are also available. Call 1-478-284-0880 to schedule your first lesson! Aircraft rental is available subject to a short checkout flight. As a licensed private pilot, I successfully passed my Instrument Rating check ride after training with Perry Air. They offered multiple experienced, professional instructors as well as reliable, instrument-certified aircraft at competitive prices. 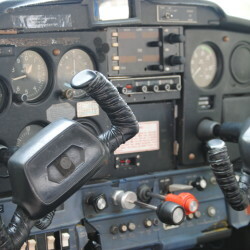 The non-towered Perry-Houston County Airport was a safe learning environment, allowing the student and instructor to focus on practical aviation techniques instead of constantly having to deconflict congested airspace. Hands-on flight training and interactive student/instructor dialog before, during, and after each flight ensured that I could approach the official examinations with confidence. I still take my repeat business to Perry Air whenever I need a periodic Biennial Flight Review or an Instrument Proficiency Check. I recently took a discovery flight at Perry Air and loved it. To my surprise on the flight the instructor let me fly the plane. What an amazing experience. The instructor was very helpful and explained things as we were flying. I look forward to obtaining my pilots license with this company and recommend to anyone that is wanting to learn to fly. Learn more about becoming a pilot. We are glad to answer all your questions.